Soup is possibly one of the best foods to eat in the winter. When the weather is miserable outside and you just want to curl up in front of the fireplace with something warm and wholesome to fill you up. Or it’s great as a lunch to take to work. A few minutes in the microwave on your lunch break and you have the perfect energy boost for to get you through to 5pm. One of my favourite things about making soup is that you can make a large batch to freeze in separate containers. Just take one tub out of the freezer before you go to bed and it’ll be defrosted and ready for work the next day. The three soups that ill be cooking today are a classic Leek and Potato, a thick Carrot and Coriander and a surprising Beetroot and Apple. All the recipes have a different stock to use but they can all be switched out for vegetable stock if you don’t eat meat! 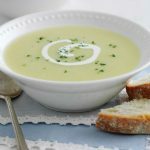 If you’re looking for something different to bread and toast to accompany your soup then you could always try one of my favourites, Garlic Roasted Broccoli. Combine some olive oil, rice vinegar, garlic, and salt together n a blender and then cover your cut up broccoli with the mixture. Pop it in he oven to roast and you have the perfect side to dip in your soup. If you like some heat then sprinkle them with some chilli flakes bore they go in to roast. Peel and slice up your potatoes into equal sized cubes around 1cm and do the same with you onion. Cut up the white part of the leek into slices (You can use the green parts to make vegetable stock). Place your pot on a medium heat with a large nub of butter inside. Once it has melted add in your chopped potatoes leeks and onions. Stir it all together so that everything is covered with the butter and cook for a 2 minutes making sure that nothing sticks to the bottom of the pot. After 2 minutes add in your stock, the bay leafs, and thyme and cover with a lid to allow the vegetables to cook and get slightly soft. This should take around 8-10 minutes depending on the size of your potatoes peices, but make sure to give it a stir every now and again to stop it sticking. Once your potatoes are cooked to the point they are firm but have no crunch you will need to put everything into your blender. It may be best to ladle the veg in and then pour the liquid in after to avoid splashing yourself with soup. You can blend it until it is at the consistency you like, personally I like it smooth. Pop it back into the pan and add the 150ml of milk, and salt and pepper to taste. As an added boost, you can serve it with sour cream and chives on top. 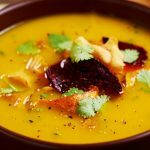 The perfect soup for a cold winter’s day, full of goodness and creamy without having to add extra cream or yogurt. Heat 1 the knob of butter in a large pan, finely chop the onion and add it in when the butter is melted and then fry for 5 minutes until they are softened. Slice up the potato into small cubes and add it in with the onions along with the ground coriander and cook for another minute until everything is coated. Add in the peeled and chopped carrots and all of your choice in stock and bring to the boil before reducing the heat. Cover and cook for around 15 mins until the carrots are tender. Once cooked tip it all into a food processor along with the fresh coriander then blitz until smooth. Return everything to pan and add salt and pepper to taste. A slightly different soup, something that you wouldn’t necessarily expect to see in this form. It gives a beautiful colour and a rich earthy taste for those cold days. As with the previous recipes we will begin with melting the butter in a pan on a low heat. You’ll want to finely chop up the onion, carrots, celery sticks and garlic and pop them into the pan. Let them cook for 10 minutes until they are soft but not coloured. If you need some more liquid to stop everything from browning the you can add a splash of water. When the vegetables in the pan are soft then add in the peeled and sliced apple alongside with the sliced beetroot. There is no need to peel the beetroot as the skin of the beetroot will add a deeper earthy flavour to the soup. Cover and sweat for another 10 minutes. Put the mix into a blender and blitz until smooth. taste and add some more salt and pepper if needed. This soup shouldn’t be piping hot to taste the best. Somewhere between warm and hot is perfect. You can also top it with a bit of feta or goats cheese, or yogurt and dill. To add an extra layer of flavour try adding some Dijon mustard in along with the beetroot and apple. If you make any of the recipes then make sure you tag me in them on Instagram over at @Run.The.USA.